I pretty much name all of my critters, so I will start by telling you this is a story about Robbie and Erwin. Robbie is a Red Tailed Hawk who came to me as a small, frightened fledgling. He couldn’t fly, wouldn‘t eat and would not perch on the stick that was in his cage. Once he began eating, I put him in a 6’x6’ outdoor cage. He still would not perch in the cage, but stayed on the ground and would hide when I got near. I was afraid that he would not make it in the wild again. I watched him every day and finally he perched, an exciting day for Robbie. He was starting to act like a hawk. After a few days, I put him into a larger cage where he would be able to fly about 10-12 feet at a time and he did just that. I was impressed with the little guy and feeling much better about a release day for him which was my goal. Robbie was doing great at this point, however, all of my other cages were full when along came Erwin. Erwin was a large, awkward Turkey vulture who was young and unable to fly, but otherwise healthy. The question was, where is he going to go? I called Judy Monestier, my mentor from Sierra Wildlife Rescue and asked if any of the birds could be put together. Judy said the Turkey Vulture and Red Tail Hawk could be put together, but to watch them at first to be sure there were no problems. This was most interesting. Robbie wasn’t sure at first, but they looked at each other as if to say, “Do I look like you?” They moved about the cage and kept a close eye on each other. Soon there was nothing to be afraid about. They would be good roommates. Now watching them was really something. I’m not sure what they thought as they looked at one another. They were now best friends. They would sit side by side on the top perches and sun themselves. Erwin would spread his wings as if to say I’m bigger than you, and Robbie would seem to say yeah, but I’m much better looking. Erwin would clean himself and was constantly trying to make himself look good. Robbie was not impressed. They did make an odd couple. But a couple they were. If one flew to the other side of the cage, the other one would fly right after him. I guess it was better than being alone. Time came to release Erwin. He was eating and flying well, no need to put HIM on live food. He very much likes the dead stuff, a very easy feeder. So release day was here. Robbie watched closely as Steve and I caught Erwin. Erwin was found close to home, so he was released here. Erwin did not fly away quickly. He went into my empty goat pen and walked around. I think he was waiting for Robbie. He looked a little lost without his friend. 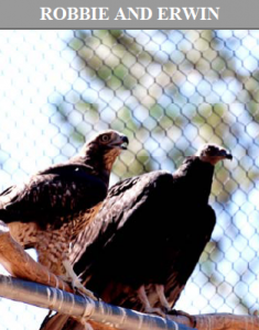 Vultures are very social birds, and are often found in large groups. After a few minutes Erwin quit waiting and took to the sky, leaving Robbie behind. He could indeed fly. Robbie was put on live mice to make sure he could catch his own food. He took to this very quickly. He would eat up to 15 mice in a day. After a couple of weeks of catching his own meals, it was finally his turn to be released. Steve and I were able to release him at a vineyard with rodents to eat and great people that love to watch birds. It doesn’t get any better than that. Well, they are both out there somewhere. I gave them the best start I could and now it’s up to them. I hope they do well. They are from two different worlds, so to speak, but spent a lot of time together, do birds remember? I will and have pictures to help me. It was great having Robbie and Erwin. I want to thank the people that care enough to bring them to us for care. And I also want to thank the people that have taken Robbie. May he eat many rodents.